Now I am sure that you are impressed and shocked that I have two posts in two days. Well I am going to do better and this hop with all these talented designers is just the ticket to motivate me. Now I am sure that some of you are curious just what a Swap N Hop is. Others..well I am sure that they have seen one of these blog hops before as they are an on going event. But if this is new to you the basic run down is this. Our wonderful hostess, Linda Anderson who plans this event every year, will partner us up. We then chat a bit with our partners to find out what they like and what will challenge them. Then comes the fun part as we get to pick out some beads and findings to send to out to that partner. At least one of those goodies are to be handmade. Once we receive our goodies, it's time to create one of more designs. Then we will show them all off today. So get ready for a good time and some eye candy. Now this is an international event and for the first time, I have an international partner. Rozantia is from Bulgaria and has an active blog at bairosan's blog. I was so excited but then disaster hit. I received my beautiful beads and the incredible wire woven pendant with real sea glass (Bet you want to see it.) but the beads I sent to her still haven't arrived. Rozantia is still planning on joining us though with some beads that she already had. We are hoping that they will still show up but I am planning on sending her more if they don't. So now let's show you the pretties that Rozantia sent my way. Here are the 'standard' beads that she sent my way; lava beads and agate. 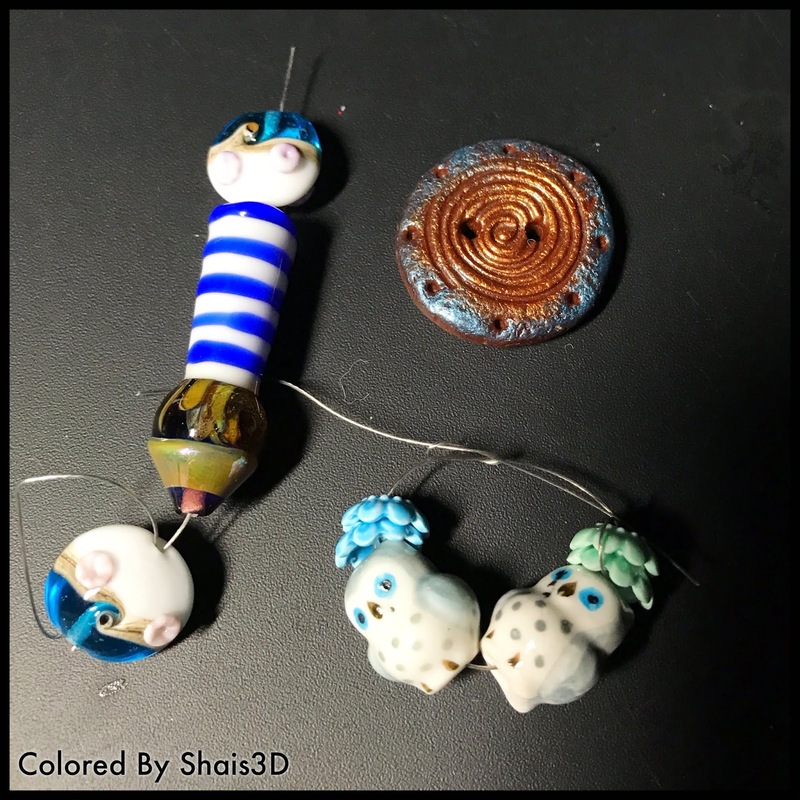 And then there was a lot of lampwork, ceramic and polymer clay. And below is that gorgeous pendant. Rozania made that! I can only wish that I had the patience and hand dexterity to pull that off. Now onto what I made. 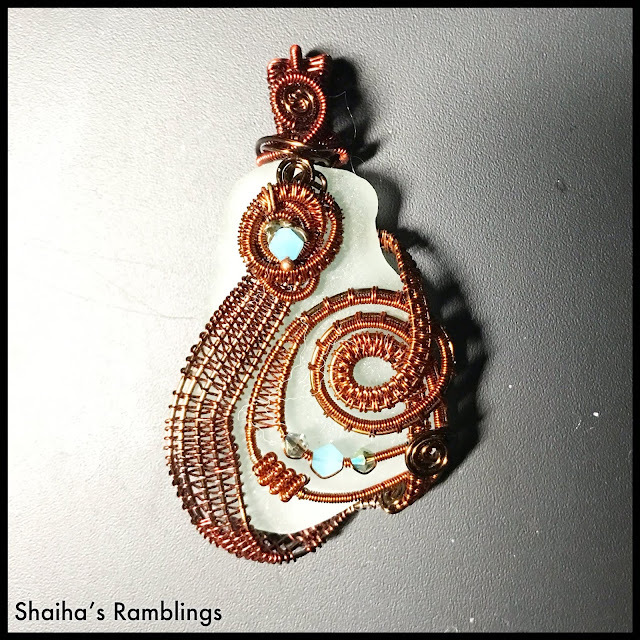 One promise that I made to myself was that anytime that I was in a swap style blog hop, I would make at least one piece for myself. And I have kept that promise though I have more then enough jewelry that I don't wear more than a quarter of it. So I just ducked around the issue and made something for my new studio. Yes you heard that right. For years, my studio was in a huge room in the basement of our house. I really enjoyed it down there though I was isolated and it was dark (hello..basement). I am in the process, far too long of a process, to move my studio up to the spare bedroom so I can be closer in case my husband needs me. It's a smaller room but I have a window! Yep color me excited. Anyways with it being a smaller room, I will be looking for ways to utilize the walls. So I hit upon the idea of using that incredible pendant in a wall hanging. And if that wall hanging just also happens to be a place to store some ribbons and silk laces, then all the better. 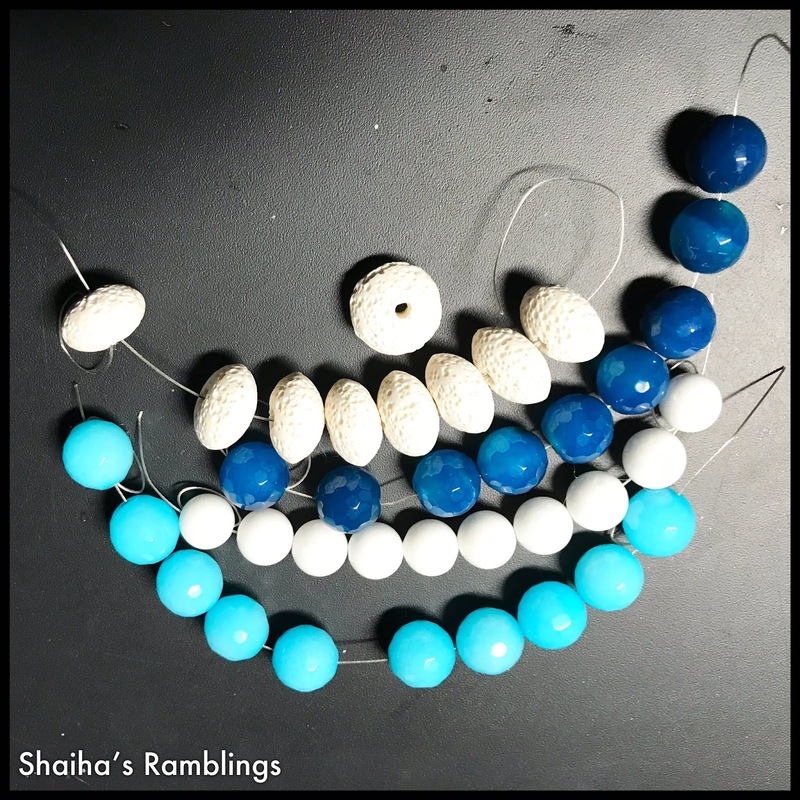 I do plan on doing more with the beads that I was blessed with but my studio got packed up while I was still pondering on just how I want to use them. I will be sure to share them as I get them completed. Thank you so much for stopping by and I did say there were several designers participating so be sure to check out what everyone has made with their goodies. Be sure to head over to From the Bead Board to get a complete listing with links. I hate to hear that Rozantia's beads still haven't made it to her, but I am sure she will make the best of the situation until they get there. As for your creation - so unique! I like how bright it is and that it's functional too. Wishing you all the best of the studio move. Enjoy your new space. I am glad to hear about your "new studio". It is alway good to have a window in my opinion. I love how you took what you loved and have it out on display for you to enjoy daily. A wall hanging is a nice way to enjoy that beautiful pendant! Nice idea! Colorful creation that you can enjoy while you are creating more lovely pieces! Enjoy your new studio! I love that you created something for you with that gorgeous pendant! such a creative and useful design too! Love your studio piece, it's so colorful. Great job you two! Such a cool way to display that pendant! I love all the colors of ribbon and how it makes a functional piece of wall art! Bravo! What a lovely way to show off that glorious pendant! I love the wall hanging as a way to display the beautiful bead and store/display beautiful ribbon. Great idea! 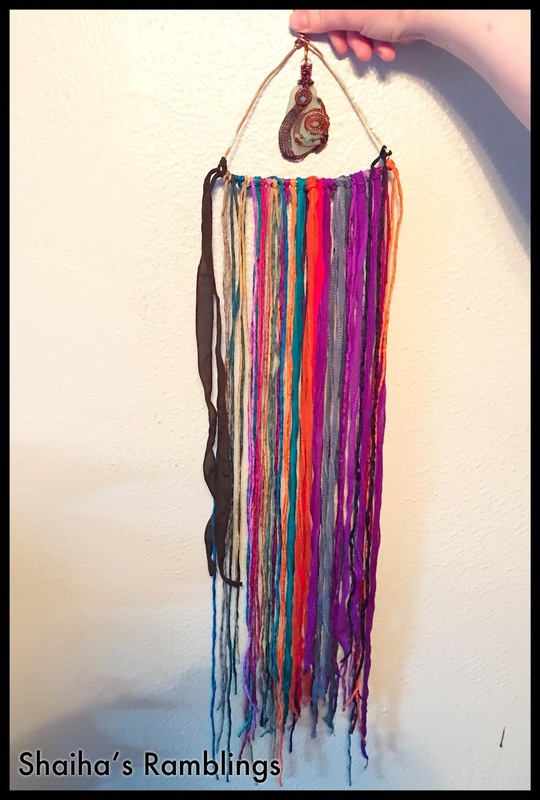 Love that you showcased the pendant in your wall hanging!